● 405 – Daegu Survey is the following of a project started this year in Busan that focus on the architecture of the 60s, 70s and 80s in the Korean cities. In Daegu, the size of the city making it difficult in three-month residency to explore all the areas, I limited my research along the 405 bus route that has the advantage of having its first stop in the village where Gachang Art Studio is located and that also cross Daegu from the south side to the west side through many central districts. I thus stopped at every stop to explore a maximum of streets around the route, researching houses or buildings and taking photographs. In total, I walked about 70 kms and took hundreds of photos that are the basis of the final drawings. The project aim is to keep traces of this architecture of the 60s to 80s being destroyed to let place to various development projects that are fundamentally changing the structure and the landscape of cities in Korea. Since only few people find interest in this architecture, it is much easier to destroy. The digital drawings isolate the buildings from their environment to let appear their architectural qualities and remove some parasitic elements (billboards…) in order to see their original features (especially when we compared to the pitiful new constructions). This project is in progress and will later explore other Korean cities to provide an overview of this rich heritage before its disappearence in the coming years. 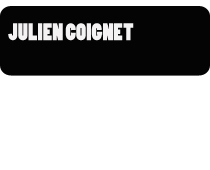 ● 프랑스 국적의 Julien Coignet(줄리앙 코와네)는 2002년 프랑스 디종의 Ecole Superieure d’Art에서 석사 학위를 받았으며, 프랑스, 한국, 타이완, 칠레 등에서 개인전과 단체전에 참여하였다. 파리를 기점으로 활동하며 최근에는 아시아의 여러 도시들에 거주하며 현재의 작업 활동을 발전시키고 있다. 10년 이상 그는 여러 프로젝트를 진행하며 우리 현대사회의 일상적인 인식을 연 주변의 것에 대한 변화를 소개하고 있다. 그의 작업의 출발은 지도, 건축물, 특히 인구가 밀집한 환경, 세계 경제 등이다. 실제 도시들의 환경과 어떻게 세계화에 영향을 미치는 지에 대해 관심이 많으며, 그는 기존의 표현방법을 사용하고 수정하여 우리 사회의 대안적 관점을 표현한다. 현재 그는 자신의 작업에 있어서 좀 더 정치적, 역사적 그리고 경제적 이슈에 대한 의문을 가지려 하고 있다. 그의 프로젝트들은 우리가 상상할 수 있는 자본주의 체재의 개념의 지속 여부와 잠재적 미래, 변화를 보여준다. ● 405 – Daegu Survey(405 – 대구 탐색)는 올해 부산에서 시작한 한국 도시들의 60, 70, 80년대 건축물에 초점을 맞춘 프로젝트의 연장선에 있다. 대구는 도시의 크기가 3개월의 레지던시 기간 동안 모든 지역을 답사하기에 힘들기에, 405번 버스의 경유지를 따라 나의 탐색의 제한을 두었다. 이는 가창창작스튜디오가 있는 마을에 405번 버스의 첫 번째 정류장이 있고, 또한 405번 버스는 남쪽부터 서쪽 방향으로 대구를 가로 지르며 많은 중심 지역을 지나기 때문이다. 나는 모든 정류소에 내려 경유지 주변의 길들을 탐색하고, 집과 건물을 조사하며 사진을 찍었다. 총 70km 정도를 걸었고, 100여장의 사진을 찍었으며, 이것은 마지막 드로잉 작업의 기초자료이다. 프로젝트의 목적은 근본적으로 한국 도시들의 구조와 판도를 바꾸는 다양한 개발 사업에서 파괴된 60년대에서 80년대 이 건축물들의 발자취를 추적하는 것이다. 오직 몇 몇의 사람만이 건축물의 흥미로움을 찾음으로, 파괴하기는 더 쉬워진다. 디지털 드로잉은 건물이 가진 본래의 특색을 보여주기 위해서 부속적 요소들을 제거하고, 그들의 건축학적 가치를 보이기 위해 건물들을 그들의 환경에서부터 분리하였다(특히 우리는 초라한 새로운 건축물을 비교할 때). 이 프로젝트는 진행형이며, 향후 이것들이 사라지기 전에 이러한 풍부한 유산의 개요를 제공하기 위해 한국의 타 도시들을 탐색할 것이다.